In May 2013, Common Sense Media set out to identify current practices, attitudes, and challenges related to the selection and use of educational technologies in preK-12 public school classrooms in the United States. An online survey was administered by Harris Interactive to 764 public school pre-K-12 teachers and 205 public school administrators. This report presents the results of our study. Number one, an overwhelming majority of teachers (86%) and administrators (93%) consider it important or absolutely essential to use educational technologies in the classroom. 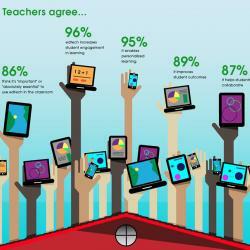 And 90% of teachers say they would like to use more edtech in the classroom than they do now. But demand and enthusiasm for technology outstrip usage in the classroom. The current use of technology in the classroom doesn't reflect this widespread enthusiasm. Funding, Access, Time, and Training. Teachers and administrators agree that the biggest challenges to integrating edtech in schools include funding, insufficient tech infrastructure, lack of time to implement, and training. Also, finding the right edtech to use is a real challenge. A third of teachers spend an hour or more each week researching products to use. 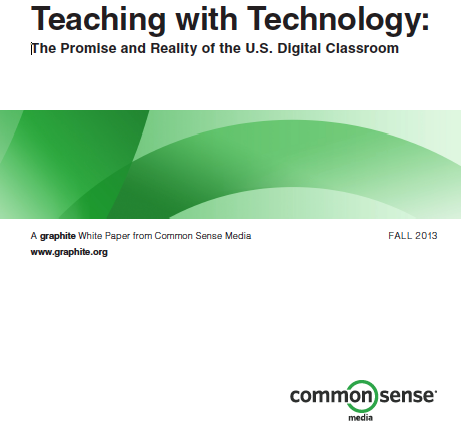 Download the white paper for free: Teaching with Technology: The Promise and Reality of the U.S. Digital Classroom. And click through to see and share this infographic that also summarizes our findings.